You have been diagnosed with celiac or suspect that gluten may be causing you problems. 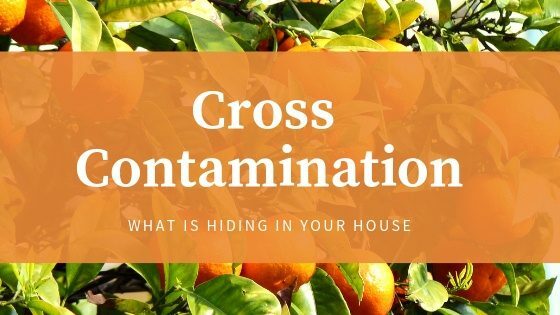 You have scoured your house, reading label after label, throwing out anything that could be a potential threat to your health. Everything has been washed and cleaned and re-organized. You have made the journey to a natural foods store and loaded up your cart with gluten free goodies. You look around you and are sure you have done everything you can to safeguard your health and well being against gluten free cross contamination. Right now, there are culprits lurking within your home ready and able to sabotage your efforts to keep yourself gluten free! Where are they hiding? Some are right out in the open on your kitchen counter. Some have taken up residence inside your refrigerator. Others are hiding in your local grocery store. One of the most often overlooked areas to gluten free living is the problem of Cross Contamination! Do what I do, buy a toaster just for yourself. Who has the time to clean out your family toaster after everyone uses it? Not I and I’m sure you don’t either. Toasters are very inexpensive insurance for your health and well being. Other small appliances also need to be purchased in pairs. Your waffle iron harbors gluten crumbs, along with sandwich makers and Panini presses. If you cannot wash your kitchen appliance with soap and water or if it cannot be placed in the dishwasher, you will need to have two of them. Make your own “For Gluten Free Foods Only” labels and attach them to any small kitchen appliance that you are dedicating to gluten free cooking. Make sure everyone knows that these are off limits for anything that contains gluten. Let’s see! Lots of interesting things in there. I see butter, margarine, mayonnaise, jellies and jams, mustard. How long has that jar of relish been in there? What do all these things have in common besides taking up space in your frig. They contain small bits of gluten in each and every one of them. Every time someone makes a sandwich or spreads their toast with butter and jam, gluten crumbs go along for the ride and embed themselves into the spread. It will be necessary for you to have all your own jars of condiments and spreads that are used in your household for sandwich making or toast or anything else that requires a utensil to transfer it to food that is made with gluten. Every time someone dips that knife into the jar, gluten crumbs are transferred over. Be sure to make labels for all of your goodies. This is a great opportunity for you to buy what YOU really like! Go ahead and get that jar of marmalade that no one else will eat but you. Splurge a little and buy some fun spreads! Corral all your spreads in a small plastic box container that you can put in your refrigerator. Having them all in one place and contained will make it easier for you to find and harder for the gluten eaters in your group to grab the wrong jar! Make it easy on them and you! Oats in and of themselves do not contain gluten. The reason they have been prohibited for celiac is that they are often grown next to fields of wheat or barley. Seeds often cross between the fields and at harvest time the wheat is taken in and then the oats right after it. They are often cross-contaminated not only in the field but also during processing. Therefore, the oats in the store have been deemed off limits. Farmers have stepped up and taken the challenge of growing oats and implementing processing procedures to ensure that there is no cross-contamination! They are more expensive than the store ones (isn’t everything we buy) but it’s great to be able to have a bowl of oatmeal or spicy oatmeal raisin cookies again. As with everything, check with your doctor to make sure you can have gluten free oats. Now, let’s turn our attention to your local grocery store. Beware the Bulk Bin Aisle! There is no guarantee that your fellow shoppers have used the scoop that was for the rice but instead dipped it into the wheat flour bin two buckets down. Once a bin bucket has become empty, there is no way you can tell if the same bulk item was placed in that bucket every time. It may have contained wheat berries, rye flour, barley flour or any number of things before the rice was placed in it. Don’t take a chance. Skip this section and buy grains and flours in packages that state the product is gluten free! Let’s belly up to the Deli Counter Bar next. Most stores incorporate their hot food items in the same space and counter area as their deli meats and cheese slicing section. The deli employee may have just pulled out a bunch of crunchy chicken fingers just before they have taken your order for sliced meats. Be careful here and diligent. Watch how things are handled. The same people may not be working in both sections at the same time making cross contamination less of a problem. Always ask for label ingredients in your deli meats and cheeses. I do know that all Boar’s Head brand meats and cheeses are labeled gluten free. This includes their brand of hot dogs, sausages, and many of their relishes. I have purchased them often and can tell you that they are fantastic! Be proactive with your new lifestyle! Information is power when it comes to gluten free! Make sure to keep learning all you can about gluten free living!